Career and Professional Development is located in the Science Library G-50. 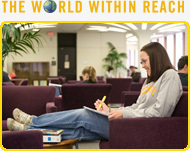 Our skilled staff members work collaboratively to provide exceptional career support for UAlbany students and alumni. Our services are available to both current students and alumni who have graduated within the past five years. We also work with employers to help them connect with students. Career coaches guide students through challenges related to work and the professional world, making major and career decisions, pursuing future education (grad school, law school, medical school) and life after college. Employer Relations & Alumni Relations team members connect both regional and national employers to our talented and diverse student body through events, informational sessions and our robust Handshake system. Peer Career Advisors are highly trained, competitively selected undergraduate students who review resume and cover letters, and provide basic career assistance to other undergraduates. We use our Handshake system to manage, events, appointments, and job and internship opportunities. All UAlbany students and alumni have access to Handshake. Employers can make an account here. Drop-in hours are 10-15 minute sessions for quick career questions, resource demos and resume or cover letter critiques. No appointment is necessary, but please bring a hard copy of your resume or cover letter with you. Drop-ins are taken on a first-come, first-served basis, with the last Drop-in taken ten minutes priorto the end of the shift. During the academic year, Peer Career Advisors are available for undergraduates Monday-Friday 9-5pm to assist you with your resume or cover letter. Professional staff members and PhD candidates will be available on the following days to assist you with your more specialized resume and cover letter needs. For help with a CV (Currivulum Vitae) we ask that you make an appointment. We are happy to provide your class, club or organization with a variety of workshops catered to your needs. Workshops must be requested at least two weeks prior, and with at least ten people in attendance. To see the list of workshops we provide and to request a presenter, please click here. Each semester, we provide numerous invaluable events for students and alumni, including our Job and Internship Fairs, information sessions, speaker series, and workshops. You can find out more about these events by logging into Handshake and viewing our events calendar. We also maintain a calendar of external events on our main page that may be of interest to students. Arriving 15 minutes late or neglecting to cancel appointments is considered a no-show. After two no-shows, your access to creating future coaching appointments will be suspended. To reinstate access, you must meet with the Associate Director of Career Counseling,Cathy Parker.